If you have ever driven along the Conception Bay Highway, you may have driven through a pretty little community called Conception Harbour. And if you slowed down to look out into the inlet, you may have seen a wreck hauled up on the shore. For a long time, the Charcot was thought to be the wreck of the SS Sposa, her sister ship. The Shipwreck Preservation Society of Newfoundland and Labrador positively identified her as the Charcot in 2013. This leaves the wrecks of the Sposa and the Stoika unaccounted for, resting somewhere further out in Conception Harbour. They sank while being towed to be scrapped just off of Bacon Cove. This wreck was the first full wreck I had ever came in contact with. Nature has now started to take her decks, with trees and shrubs starting to peek over her rails. That being said, she is still in one piece, with water starting just above her wheelhouse. If you're feeling adventurous (or like to push yourself, which is what I did) you can easily get within five feet of her bow. And if you like diving, the Southern Foam and the Sukha are just off her stern, in about thirty feet of water. 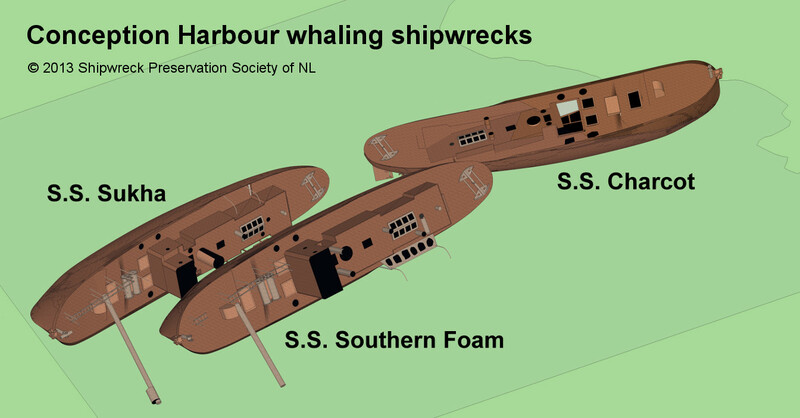 Check out the Shipwreck Preservation Society of NL's maps of the wrecks here and here. And if you do happen to find the Sposa and Stoika, let me know, because that would be pretty awesome! That's it for this week's "Over the Waves". Have a great week everyone!